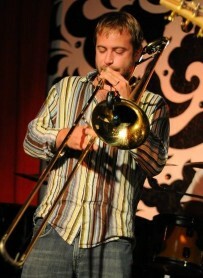 “Rumba Jam Redux, EOP-style” at Rumba Cafe: Trombonist Evan Oberla hosted a weekly jam for several years, starting at Rumba in 2009 and wrapping up at Ruby Tuesday in 2011. He announced today that he is starting a new open jam at Rumba this week that will happen every month or so. To quote Evan, “Since my group EOP is ever evolving and constantly working on new material I thought it would be great to have these nights to work out some new stuff with the group in public.” Music starts around 9. Jazz Jam at Park Street Tavern: This weekly jam, hosted by saxophonist Pete Mills, is always a great place to hear spontaneous local jazz. This week’s edition has an added ingredient, however, as Dan White, Jon Lampley, and Chris Ott of DW6 will join the jam as special guests. So, whether or not you missed their farewell shows, you still have another chance to see them play before they move to NYC. The first set will start around 8:30.